I keep spelling the name of my favourite new Django Django song incorrectly. It's spelt 'Hail Bop' not 'Hale-Bopp' as in the great comet of 1997 discovered by Mr Hale and Mr Bopp. It is still a tribute to that dirty great crusty gaseous snowball in the sky, but with a clever little play on words to catch people like me out when we're searching for it on the internet. I'm picking up little hints of Weezer meets Man or Astro-Man and I unapologetically love it. The song is taken from their recently released self titled album and is in the running as one of favourites of 2012 so far. and now you've taken off again." If Hale-Bopp survives it's trip around the sun without melting it won't be back until around the year 4588, by that time I'm fairly certain you, me and Django Django will all be kicking up daisies (or whatever flowers are around then). Maybe we'll have colonised the moon? 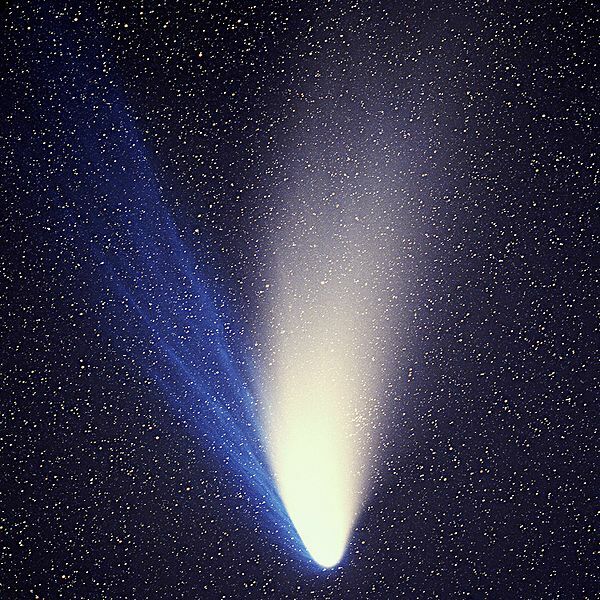 The last time comet Hale-Bopp visited we hadn't even built Stonehenge. Amazing.